After my previous blog post, I have seen an increase in awareness and concerns around the NHS database rollout. Yesterday, it was announced that the rollout has been delayed for six months, as the public were not appropriately made aware of what would be happening to their data. 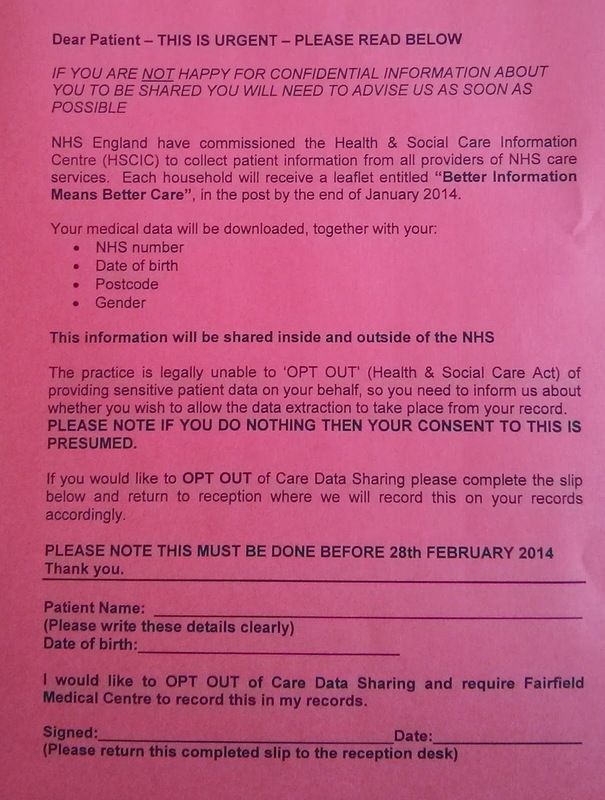 As you can see the data being moved from the GP surgery to the database is you NHS Number, Data of Birth, Post Code and Gender, along with your medical records. The data being used or sold will be age bands, area and gender, along with your medical records. I have concerns around how the data will be transferred to the main NHS database, as well as the data itself. I appreciate that they will then modify the data before selling it, but I would then have concerns around how this data is stored, who will have access to it and what safeguards are in place to protect the original data, rather than the anonymised data. There is then the ethical questions around selling patient data to third parties. It sounds extreme, but if a third party had access to your medical records and your postcode, it would take much to correlate this with information in the public domain to get your in address and/or telephone number. If you had a serious medical condition, would you want to be bombarded by calls and letters selling care homes or even funeral services! I wait to see what happens in the next six months around this, but suspect I will still opt-out!